The Reface DX from Yamaha is a frequency modulation synthesizer offering simple controls and complex sounds in a small size. Based on the DX-7 synthesizer, the DX is a re-imagined interface providing 8-note polyphony with four operators and twelve algorithms that capable of creating a variety of sounds from retro 80's to modern EDM. The DX's front panel offers a display screen and a multi-touch control interface to access functions, making sound design and exploration fast and easy. The operator section offers four operators arranged with twelve algorithms allowing various combinations of carriers and modulators. Full editing is available within the system menu allowing access to modes, frequency, and detune. Additional parameters include level controls, velocity sensitivity, feedback, and keyboard scaling rate. The envelope generators feature the classic attack, decay, sustain, and release (ADSR) controls. An envelope sets volume levels for carriers, while modulators offer a degree of modulation. The LFO or low-frequency oscillators offer seven waveforms which can modulate any of the operators. There is also a pitch envelope which changes the operator's pitch over time. Additional features include a pitch-bend lever, built in stereo speakers, a dedicated volume control, an octave slider, and a looper section which operates a phrase looper for recording and playing back multiple, overlaid loop phrases. On-board effects include distortion, touch wah, chorus, flange, phaser, delay, and reverb with additional controls for depth and time. The DX can be switched between mono and poly and offers portamento or glide. 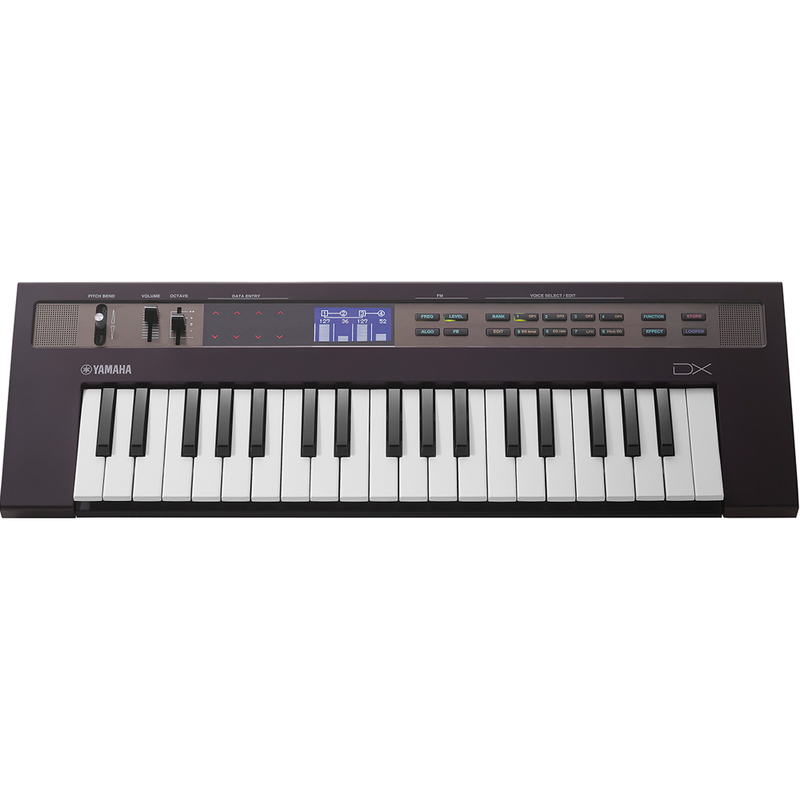 The miniature 37-note keyboard utilizes the same High Quality (HQ) technology as Yamaha's flagship Motif XF workstation keyboard, offering a premium feel and fast response for accurate and natural playing. The DX can be powered by six "AA" batteries and offers a foot control connection for a sustain pedal. Other connections include two unbalanced 1/4" / 6.35mm outputs, a stereo 1/4" / 6.35mm headphone output, a stereo mini TRS 1/8" / 3.5mm input, and a mini-DIN connector providing MIDI in and out. Additionally, a USB connection is offered for connecting the instrument to a computer or iOS device. There are 32 on-board preset memories and an iOS app is available to work as a librarian with parameters responding to MIDI CC controller data. The DX synthesizer ships with a power adapter and a MIDI breakout cable.